Can we have a sticky content on all pages of a multi-page form? Something like a sticky footer message. Also is it possible to show a content on a page after the "page break navigation" bar? You can just clone the sticky content and distribute the clones across all pages of your form by placing them after each page breaks. 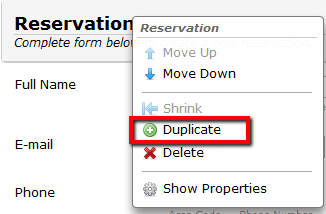 Right click on the field you want to clone then click Duplicate. As for your second question, no, it is not possible to show content after the page break bar. I was actually looking for a "footer" kind of thing to provide some additional information to visitors. But unfortunately as we can not show content after the page break bar, it's not being possible at all. You can still show a "sticky" footer although it would be displayed above the page break bar. Can you set up your form to automatically email to the person completing the form? Then, they could print the PDF version that is automatically generated when the respondent clicks the "Submit" button. Thoughts? Could you please post your question in a new thread? It's unrelated to the topic at hand. I think you misunderstood the nature of the post. I am trying to figure a way to work around not being able to print all pages. It’s not realistic to believe in a multipage form that a respondent is going to print each page as they go along. My question then is, can you have the form auto emailed to the respondent with the instruction to print their responses for their records? Does this help to clarify? Hello Brian. I believe abajan understood your quesion, that's why he said your question is not relevant to the topic and for that reason, he's asking you to create a new post. Anyway, just to answer your inquiry with data submissions, you can create an auto-responder that will automatically send an email to the form user's e-mail address (provided that you have an email address field in your form) and the details of the submission can also be included there. Is this what you're trying to achieve? Actually, I don’t think understood what I am trying to achieve. The problem I am trying to address and that is relevant to the thread is printing the completed form in its entirety. According to the thread, you must use a print button on each page of a multi-page form, which is impractical to think the form respondent will do. The reason for submitting the question as it relates to auto response is to work around the PRINTING issue. I want to auto respond to the person submitting the form with a PDF of their responses to the form so that they have a PRINTED hard copy record. Can this be done? I would think yes since I receive a PDF version of the form in my “Submissions” box. I hope this helps to clarify why this is on point with a thread about working around a problem with printing a multi-page form. I am simply trying get to that answer. I really don’t care which thread it’s in. The goal is to have a separate thread for each inquiry to make our forum more organized and more helpful for other JotForm users.